On a white base card I stamped a snowy image from La Blanche and glittered it up with a versamark pen and some WOW embossing glitter. Unfortunately it doesn't show up well and I got fed up taking photos from every which way!!!! 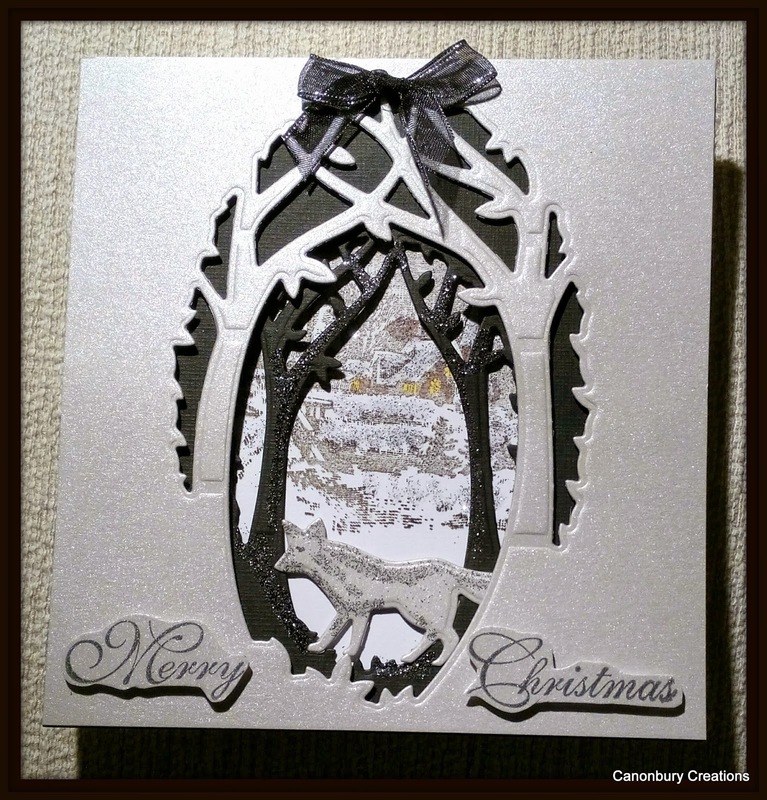 The die cuts are from Xcut, cut on matt silver and black card and the sentiment is SU Greetings of the season. No snow here yet although it has tried but 28 miles up the road there was several inches. Hope you are all safe and warm. Awesome card, love the scene through the fantastic die cuts. Love this card Val and the way the trees lead you through to the back of the card. Great dimension without having too many layers. No snow here either apart from a bit on Thursday......hoping that's how it stays!!! Hi Val, this is beautiful. 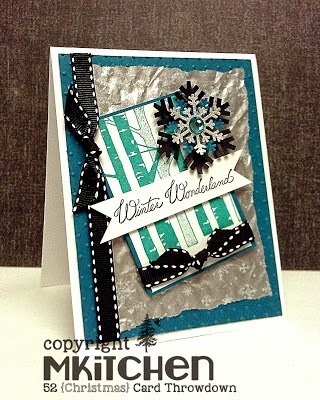 Love the silver and black with the diecuts and touches of sparkle. Great take on Mynn's card. Thank you for taking the time to leave wonderful encouraging comments on my blog. I hope you're having a good weekend. No snow here yet! Gosh, what a fantastic die cut scene! Love the debth they give to this scenery! Oh you are good making a Christmas card a week Val... I should do it too!! Love peeking through the woodland on the snowy village, beautiful card. Had a bit of snow here but has all melted now!! What a beautiful Christmas scene you created! I love the tree dies in black and silver! Thank you so much for sharing with us at the CASE-ing Christmas Challenge! Hope to see you again! beautiful card, val...love all the sparkle! What a lovely card! I like your take on Mynn's card this week. Great job! Great card, I love your take on Mynn's card. Thanks for joining us at CASE-ing Christmas. Absolutely stunning, Valerie. Love that scene you've create. Thank you for sharing your project with CASE-ing Christmas.